Step types are the building blocks of your workflows. They provide basic information as to what happens when the step is executed and how it is represented. When a step type is added to a workflow, it becomes a step but still references all the properties of the original step type. Multiple occurrences of a step type can appear in a single workflow. Execution—Defines the step behavior of the individual steps when executed in a workflow. Custom steps built using IJTXCustomExecute can be run with the current version of ArcGIS Workflow Manager. However, you are encouraged to upgrade your step libraries to take advantage of the new options with IJTXCustomStep. See the developer kit for help upgrading step libraries. The following subsections explain how to build a step type. With the basic step properties, you provide descriptive information for the steps that comprise your Workflow Manager system. Open the Workflow Manager Administrator and connect to your Workflow Manager database. In the Administrator, browse to the Step Types folder under Job Components. The list contains all the currently configured step types. If no step types are configured, the list will be blank. Right-click the folder and click Add Step Type or choose an existing step and click Edit Item. The Step Type Properties dialog box appears. Provide a name and description for the step type. Choose the indicator for the step. This setting defines the shape of the step in the workflow. If the user needs to interact only with the logic of the step, check the Hide WMX While Running check box. This setting is most useful when the step will open another application with which the user will interact with, such as ArcMap. If it's fully automated, don't check the box. Step descriptions allow you to provide specific information about the step that will be shown to your users in the Workflow Manager client application. On the Step Type Properties dialog box, click the Description tab. URL Link—Choose this option if all Workflow Manager users have access to the link. This can be a link to a web page or an .html document you've authored. Embedded HTML—Choose this option to provide simple text or HTML formatted text that will be available to all users, regardless of how they access the Workflow Manager system. If the step description uses Unicode characters, make sure that your HTML content contains a meta tag that specifies the character encoding, for example, <meta content="text/html; charset=UTF-8" />. Use step descriptions to provide detailed information about the step to the user. 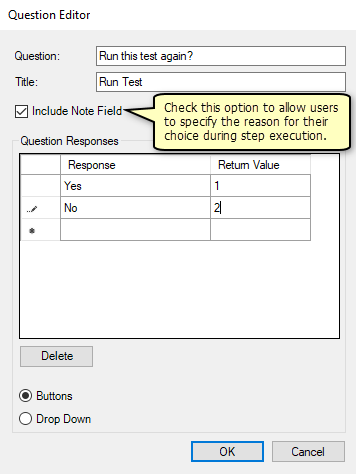 The Execution tab allows you to configure the behavior of the individual steps when they're executed in a workflow. On the Step Type Properties dialog box, click the Execution tab. Click the Custom Step Object execution type button. Click the CLSID/ProgID browse button and choose the step to use. Choose what should happen when the user executes or reaches this step in the workflow. Click OK to close the Browse for Custom Steps dialog box. 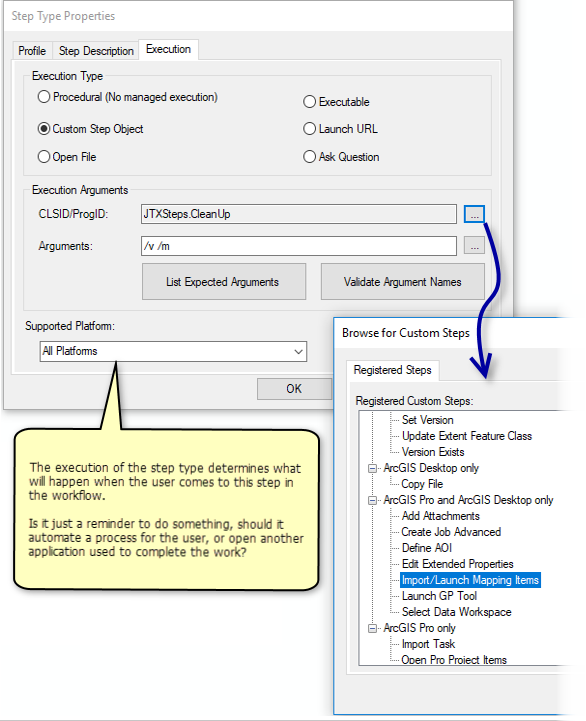 Click List Expected Arguments to see a list of required and optional arguments for the custom step you chose. Click Validate Arguments to ensure that the arguments you provided are valid. Click OK to save changes to the step type and close the Step Type Properties dialog box. Some custom Workflow Manager steps can accept dynamic arguments using tokens. Arguments should be separated using spaces. In the case where the argument itself contains spaces, enclose the argument in double quotes ("). Not all custom steps that are included with Workflow Manager can be executed on the web. The steps are divided into two categories: DesktopSteps (which run on desktop machines only) and Steps (which can run on the desktop or on the web). The Execution tab also allows you to open a file through a Workflow Manager step. Click the Open File execution type button. Click the File Path browse button. 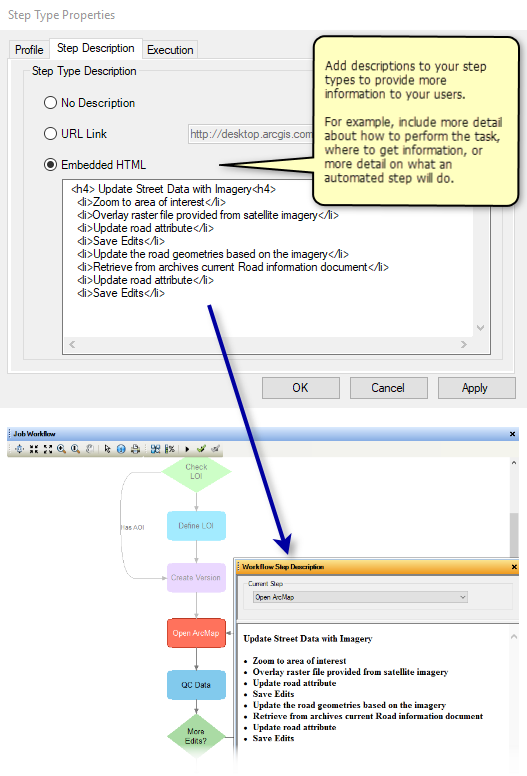 Browse to the file that you want Workflow Manager to open during the execution of this step. This file will be stored in the database. If it's large, you may need to work with your database administrator to increase the MAXBLOBSIZE setting. Click Open to associate the file with this step. Click the Supported Platform drop-down arrow and choose the supported platform for the step. The Open File execution type works on both the desktop and the server. Click OK to save the step type and close the dialog box. The Execution tab also allows you to run an executable through a Workflow Manager step. Click the Executable execution type button. Browse to the location of the executable you want this step to execute. Provide any arguments for the executable. Keep in mind that tokens can be entered here. Click the Supported Platform drop-down arrow and choose the supported platform type. This option allows you to open a web browser with a specified URL through a Workflow Manager step. This step can be configured with a web map or web editing application URL and the [JOB:AOI_ENVELOPE] token to zoom to the location of interest of the job on the map after it's opened. Append the extent=[JOB:AOI_ENVELOPE] to the web map URL, and prefix the parameter with ? if the extent is the first parameter in the URL, or prefix with &, for example, http://www.arcgis.com/home/webmap/viewer.html?extent=[JOB:AOI_ENVELOPE]. Click the Launch URL execution type button. Provide the path that you want to launch when Workflow Manager executes this step. Click the Supported Platform drop-down arrow and choose the supported platform. The Launch URL execution type works on both the desktop and the server. The Execution tab also allows you to define steps that ask your users questions when executed in the Workflow Manager step. Click the Ask Question execution type button. Click the Question browse button. The Question Editor dialog box appears. Provide the question to be asked. Provide a title for the dialog box that will appear to the user when the step is run. Provide the possible responses in the text box on the left. Click Add to add them to the options or press Enter as a shortcut and add another response right away. Check the Include Note Field check box to allow users to provide feedback. The user is presented with a text box to provide the reason for their selection. The value entered is appended to the job history as a comment. Take note of the return value in this list. If you're routing your workflows based on the response from the question, this value will be the return code from the step. Use this return code in the path properties for automatic advancement of the workflows. Provide the question you want to ask as well as possible responses on the Question Editor dialog box. The Ask Question execution type works on both the desktop and the server. The step types in your Workflow Manager repository can be reused. You can make a copy by cloning the step type along with all the defined properties. The list contains all the currently configured step types. Choose a step, right-click, and click Clone Step Type. A copy of the step type is added to the list of existing step types.